To complete the diploma students will need to have completed the above requirements, passed 3 theory tests during the year, one theory and one practical skills examination at the end of the diploma study. Students must also complete their cases studies to an expected level, hold a First Aid certificate and have completed a minimum NZQA Level 4 Anatomy and Physiology Certificate (This must be obtained from an outside provider a list of options will be made available to interested students). On completion of the Diploma students may apply for membership with Reflexology New Zealand (RNZ), the New Zealand reflexology governing body. RNZ is a self governing association who sets its own high standards of education. The successful students will have the knowledge and skills to practice reflexology in a clinical environment as fully qualified reflexologists. The content of the diploma may be changed at any time by the Southern Therapies School of New Zealand as considered necessary for the students best education. The Southern Therapies School of New Zealand aims to provide students with quality, in depth training to ensure they become professional practicing reflexologists who will contribute to the growth and development of reflexology in New Zealand. Students are required to complete a minimum of 6 case studies of 6 treatments per study (36 hours per study) to be completed 1 week apart for 6 weeks. Students will be expected to be punctual. If unable to attend a seminar students will be required to inform the tutor and will need to arrange to cover missed work (this will incur an additional cost). If the student is unable to complete the course they may be able to postpone their learning until a later date – this is subject to the tutors discretion and decided on a case by case basis. Students are expected to be polite, caring and thoughtful of all class members at all times. The Southern Therapies School of New Zealand reserves the right to refuse to teach a student who is continually disruptive, and has measures in place to help guide and facilitate issues to help ensure a happy, healthy learning environment. passing final theory and practical examinations. If a student does not achieve a pass in the final theory or practical examinations they may re attempt these not more than one month after the first attempt. A re-examination charge of NZ$150 will be incurred. 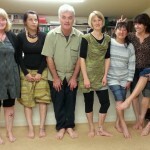 The Diploma in Reflexology Course fee is NZ$3,600.00 GST inclusive. A deposit of $360.00 is required with receipt of the application form, this will be refunded should the applicant be unsuccessful. 3rd and final payment of NZ$1080 one week before 8th seminar. Students failing to make payments will be unable to continue study. If the course does not proceed due to numbers or any other reason The Southern Therapies School of New Zealand will fully refund the applicants deposits. Refunds will not be payable once the course has commenced. Alternative payment options to suit students may be discussed with the school prior to commencement. For courses exceeding 3 months , withdrawal may be made within 7 days of starting. This must be in writing and a refund will be paid less 10% of the total or $300 administration & Tutoring fee, whichever is lesser. The Southern Therapies School of New Zealand will hold your course fees in a separate account until after the first seven days. After this date all course fees will be deemed as owing to The Southern Therapies School of New Zealand. No certification will be issued until all fees have been settled. Please complete the enquiry form or registration form to contact the school for an Enrollment Booklet, Policy and Procedures document to see an in depth breakdown of the Diploma training. We welcome your enquiries and are happy to talk things through with you and answer any questions you have.